Douglas P. has stated that Death In June had not demoed any albums since they made some 4-track recordings for The World That Summer. But what we have on The Snow Bunker Tapes is the demo recordings made by Douglas P. in a snow drenched cabin for what would become the piano based Peaceful Snow album, which in itself marked a major departure in terms of sound for Death In June. 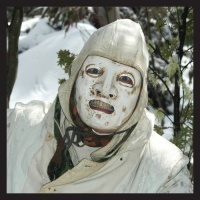 Despite the change in musical articulation the atmosphere of that album remained resolutely Death In June. The Snow Bunker Tapes matches the running order of the original album, Peaceful Snow, but here Douglas P. brings a fresh and revealing dimension to The Snow Bunker Tapes. Douglas P.'s vocal, which acted as a guide to which the Slovakian pianist Miro Snejdr transcribed his scores, is largely unadorned, backed by his customary guitar strum resulting in a less sombre but more direct approach, that almost parallels the "Totenpop" songs found on The Rule Of Thirds. Yet there is a nice acoustic tone and warmth to these recordings - that's not found on the piano based scores of its parent release. As expected, much of this is merely acoustic versions of what would become the Peaceful Snow album, such as the opener 'Murder Made History' which plays out to acoustic strum with multi-tracked vocals and soft cooing. By the second track 'Fire Feast' featuring an alternate vocal take it becomes clear this release is something else, with subtle differences in tone and atmosphere. And it is these differences that make the release of The Snow Bunker Tapes really worthwhile. The change in direction on Peaceful Snow was largely well received. Those songs were inspired by Douglas P. hearing Miro Snejdr's piano interpretations of earlier Death In June songs. Initially the idea was for Miro to provide instrumental piano versions of songs from the Death In June canon. At this point, even Douglas P. couldn't envisage Death In June making another acoustic guitar based album. So it's surprising to find that so many of these songs have been arranged, even if it is minimally, and given the quality of songs it's even more surprising that these are merely representative of a work in progress. The title track carries a faint echo of 'She Said Destroy' in its beginning chord sequences, with the vocal delivered melodically and rhythmically in a different timbre, amidst the spartan percussion, wind chimes and tambourine. The acoustic playing of 'Life Under Siege' is sprinkled with lightly played notes - often out of tune, playing on the lyric "for life out of tune". There's also a lightness to the acoustic setting of 'Our Ghosts Gather' that contrasts with the low and hushed voice of Douglas P., with a lyric that deviates from the Peaceful Snow version. The coldness that informed the recordings is captured on 'The Scents of Genocide'. Handclap rhythm underpin the acoustic settings of 'Wolf Rose' and 'Cemetery Cove', while a higher registered vocal accompaniment and playful sinister electronic ringing tones surround 'Red Odin Day'. The effect of these acoustic renditions is to reappraise the individual tracks, resulting in less favoured songs becoming more important. The inverse is also true. The melancholic nature of 'My Company Of Corpses' doesn't hit the heights of the original version of Peaceful Snow. This time Douglas P. sings over acoustic strum, massed harmonies and the striking of metal tubes. While all tracks bring something different, 'My Company Of Corpses' feels better suited to the piano score. That said, both 'Neutralize Decay' and 'The Maverick Chamber' the final tracks on The Snow Bunker Tapes play out in a straightforward acoustic manner.